GaijinSenshi: i think it does, don't count it out yet. 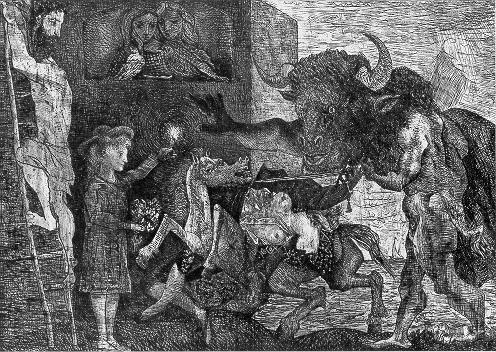 Why does the artist place the picador on her horse between the minotaur and the girl? 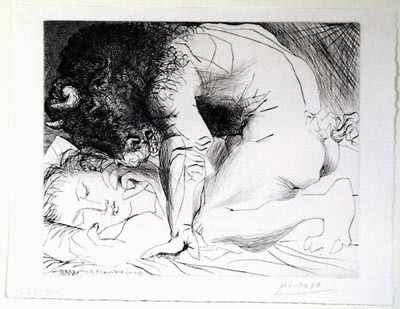 I believe Picasso's criticism of himself, the way men use their strength to have their way, how women use their bodies to conquer men is the subject of many of his prints. Here, the bare-breasted woman picador holding her sword and draped brokenly over the horse has failed in her purpose to conquer the minotaur through body alone because the minotaur, even as he shields his eyes from the light, wants what the young girl and the light represent. He wants to see, to know, to feel, to be kind. 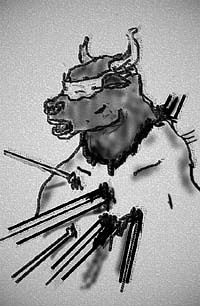 The bull aspect of himself alone does not satisfy him. He wants power and tenderness together, body and thoughtful seeing together. spinning and spinning did she think i didn't care?